The first Table shows wire gauge vs resistance per 1000 feet. A fast and easy way to see the wire resistance changing as the wire gage changes. Standard wire sizes used in a number of Interface Buses [for data lines] are #22AWG, #24AWG, #26AWG, and 30AWG. More than any other wire size 24 gauge is used by a vast number of electrical interfaces. When you compare the table above with the AWG table below small resistance values may be noticed. However the point of the table is to quickly show how the resistance varies. Of course the table below shows the actual values as they change over temperature. Use these guidelines for Cable Derating to insure the cable functions over the proper temperature range. A larger gauge wire may be required at higher temperatures to sustain the same wire resistance. So wire gauge needs to be selected at the highest temperature expected, as far as resistance is concerned. As wire resistance increases so does cable heating. AWG wire gauge for current capacities. Aluminum electrical Wire gauge chart page. Table of AWG sizes in metric. 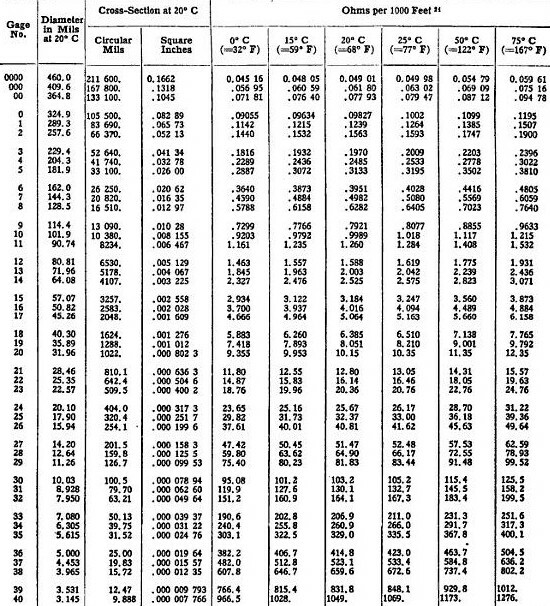 The table above provides data for Gage numbers from quadruple ot  to 40 gage. Along with the diameter and cross-section for each gage. Temperatures are given in both centigrade and Fahrenheit. Of course the Diameter in Mils and the Cross-section in circular mils are provided at a standard temperature, 20C. The first table in combination with the second table offer a good start for selecting a wire gauge for data exchange. 24AWG Frequency vs Attenuation in dB/meters. So the table provide DC resistance and the link provides AC resistance [for 24 gauge wire]. Which leads to the two reasons to select the correct gauge wire; resistance or Wire Current carrying capacities. Data or signaling use resistance per gauge, while power lines use Current carrying ability. Speaker wire is normally around 16AWG [16-Gauge], also 18-gauge and 14-gauge are common. but as the cable run increases the gauge or wire diameter should also increase. Speaker wire may be either solid copper wire or stranded copper wire, with stranded wire being the most common usage. Companies making Electrical Wire and Cable. Also see the Color Codes used on wire Insulation page; Color coding of wire insulation based on application. Determine cable length vs. voltage drop. Determine cable length vs. Heat increase.